Code Club want to say a big thank you to the fine folks at Bytemark, a York-based hosting company who are generously providing a large portion of our server space requirements for free. Code Club UK has, for some time, been hosting our websites with Bytemark. This is a service that they give us free of charge, and this is a big deal for us. Code Club is funded by donations such as this one, and without the generosity of companies like ByteMark we’d be unable to do what we do. By allowing us to host our services for free, Bytemark effectively contributes around £3000 to £4000 a year in server and bandwidth costs! If you’d like to help contribute to Code Club’s goals, by donating money or in any other way, we’d love to hear from you. Visit https://www.codeclub.org.uk/support-us for more details. Coming up at the end of July is a fantastic opportunity for enthusiastic young digital makers and tech fans to get stuck in with some summer holiday coding fun – the Young Rewired State Festival of Code! “Every August, Young Rewired State runs the world’s largest annual hackathon for young people. The ‘Festival of Code’ is a week-long celebration of young technology talent, bringing together coders aged 18 and under from all across the UK – and the world – to build projects together which solve real world problems. We welcome any young person who has had some, even just basic, coding experience and most importantly loves digital making and wants to learn more! Over the past six years, we’ve worked with over 2,000 young people in the UK and abroad, with lots of our alumni now returning to mentor the next generation of young coders. At the Festival our community gather from Monday to Thursday at volunteer-led local centres to make new friends and prototype projects using their coding skills and open data. They then come together for the Festival weekend where they showcase what they have built to parents, mentors, press, industry and expert judges. The Festival of Code 2015 is taking place from July 27th to August 2nd and is going to be our biggest and best event yet. As well as the open data hackathon, we’re showcasing the best and brightest in technology today at our YRS Makerspace. We’re also excited to expand our community with 75 centres across the UK and five international centres participating remotely across three continents. If any of Code Club’s community of young coders would like to participate in the Festival of Code, they can register here and a full list of local centres can be found here. BBC micro:bit launches in London! On Tuesday we attended the launch of the BBC’s exciting new micro:bit project in London. As a partner organisation of the BBC’s flagship Make It Digital initiative, which aims to get more young people across the UK involved in digital making and computer science, Code Club couldn’t be more excited to see the new micro:bit revealed in all its pocket-sized glory! 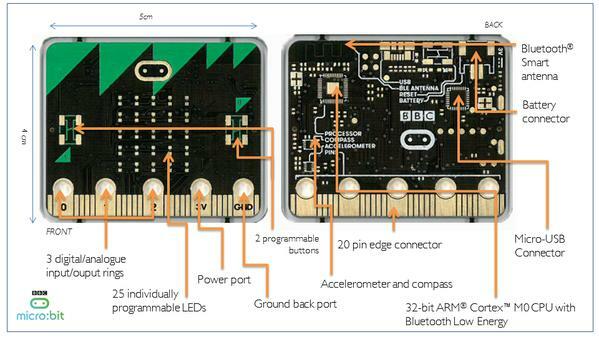 The micro:bit, measuring just 4cm by 5cm, is a stripped down computer which children can use to code and create anything they set their minds to! It’s intended as a starter device to give children a basic introduction to physical computing and tinkering, so that they can move on to using the more advanced machines such as Arduino, Galileo and Kano. The introduction of the micro:bit has been inspired by the success of the BBC Micro back in the 1980s (a tool which gave a lot of our Code Club volunteers their first hands-on experience with coding and computer science). We’ll be supporting the BBC micro:bit initiative by creating a set of learning resources for the device, which will be available to use in our Code Clubs to help children harness the power of the device and to see the impact that programming can have on their day-to-day lives. Children will learn introductory programming and computational thinking concepts, and apply them in making a range of fun programs for their micro:bit. We’re also really thrilled that the BBC will be providing us with 20,000 micro:bits so that our Code Club members and volunteers can get a chance to use them too – for free! Stay tuned for further details coming soon.